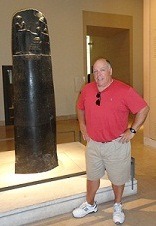 Rob Mattern with The Code of Hammurabi in Louvre, Paris. It is widely believed that the oldest legal document known to mankind is the Code of Ur-Nammu, created in 2050 BC by King Hammurabi. This is not entirely accurate. In truth, the oldest legal document known to mankind is the off-site records storage contract that was created in order to store the code off-site from King Hammurabi’s palace. Rumor has it the Sumerians are still negotiating reboxing fees.